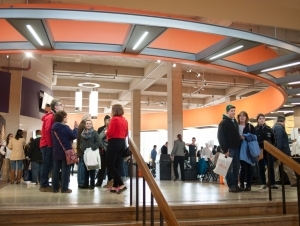 Prospective students and their families are invited to experience Buffalo State’s diverse and creative environment during the college’s two Fall Open Houses, Saturday, October 13, and Saturday, November 17, from 9:15 a.m. to 1:00 p.m. Both dates offer the same program. View the full Open House schedule (PDF, 4 MB). Open House attendees may check in at Rockwell Hall beginning at 8:30 a.m., attend a welcome program in the Performing Art Center at Rockwell Hall from 9:15 to 9:45 a.m., and then have the opportunity to learn more about academic departments, student services, and student clubs/organizations at information tables in the Campbell Student Union from 10:00 a.m. to 12:30 p.m.
Those looking to experience a slice of campus life can visit the Burchfield Penney Art Center at Buffalo State (a docent-led tour will be held at 2:00 p.m.) or catch an athletic event. The women’s soccer team hosts Cortland at 1:00 p.m. at Coyer Field on October 13; the men’s basketball team takes on John Carroll University at 6:00 p.m. in the Sports Arena and the men’s hockey team faces off against Oswego at 7:00 p.m. in the Ice Arena on November 17. Students and family members planning to attend a Fall Open House should register online or call (716) 878-4017.